We hope that Spring is here at last, and not just another day on the calendar, either. 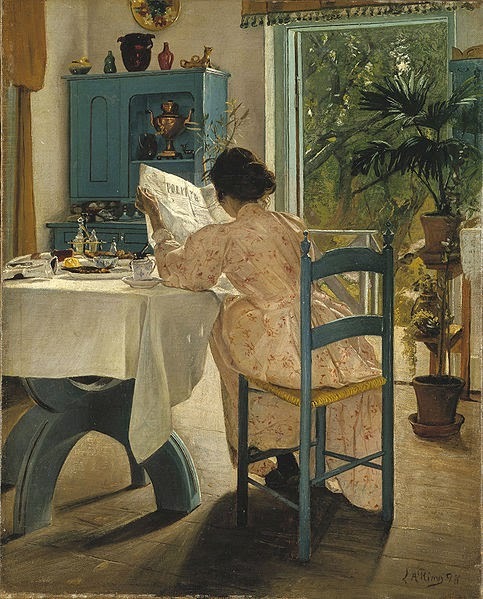 Here's our first Breakfast Links of the new season: our weekly round-up of fav links to other blogs, web sites, articles, and images, gathered fresh via Twitter. • Ready for summer! Beauty & the beach, a guide to 1920s-30s pyjama dressing. • Walk through 19th c. London with the Museum of London's Victorian street view. • Artistic cross-pollination: Mughal flower studies and their 17th c. European inspiration. • A 9th c. bell and its shrine believed to have belonged to St. Patrick. • Image: We're sure that a typo like this, on the first page of your book, was just as painful in 1830 as it is now. • Fantastic set of photos of working class Philadelphians, 1910-1940, by John Frank Keith. • True crime: a Manchester detective and an 1871 London murder case. • Eighteenth century recipe for Irish Sack, a treat for mice & men. • Image: Stupid medieval behavior: sawing through the border decoration. • Not what you think (unless you're from Philadelphia): the humble Irish potato, a St. Patrick's Day ambassador of good will. • What William Shakespeare's classroom looked like. • A medieval meal for real. • Image: Gladys Zielian had The Look in 1919. • Companions in battle: animals of the American Civil War. • Happy ending for an old Vermont bookstore. • A sad tale of 18th c. illegitimacy, and a young mother hanged within weeks of the birth. • Fascinating history of NYC's 75th Street Riding Academy, built in 1887 - now home to cars, not horses. • Image: Lantern Walkway, Chester, England. • Sixty years ago, young women programmed the ENIAC, the first all-electronic programmable computer. • A persistent history myth: the colonial "courting candle." • A cockatoo perched in a Renaissance painting forces rethink of history & early trading routes. • All your questions answered about medieval charms. • A Brooklyn, NY woman's colorful quilt, 1867, reflects her experience of the Civil War. • Fifteen exquisite historical fashion accessories. • A NSFW ebook-download via Guttenberg guaranteed to liven up your reader: The Merry-Thought: or the Glass-Window & Bog-House Miscellany, a compilation of 18th c. bathroom wall graffitti. • Image: Pultney Bridge, Bath. • Greek fire: nine facts about the Byzantines' secret weapon. • The dark history of Jack Sheppard, an infamous 18th c. criminal. • A bumpy bike ride to equal rights. • Five 17th c. women printers and booksellers. • Image: Gorgeous Georgians at the Fashion Museum, Bath, England. Re the young woman with an illegitimate pregnancy, good grief. “Desiring her example might be a warning to all thoughtless young women, and calling on Jesus Christ for mercy, she was launched into eternity amidst thousands of commiserating spectators". I love the photos of working class Phildelphians. I have pictures of my dad's Italian working class family that are nearly identical to some of the ones at the LCoP. I also love the Civil War animals. I wonder about the camel's story. The others were so sweet and sad. I loved the Fashion Museum in Bath. I took hundreds of pictures of gorgeous gowns! I love the Regency and Victorian gowns the most. The Georgian gowns are exquisite but not something I would ever want to wear.